A massive ancient ocean once covered nearly half of the northern hemisphere of Mars making the planet a more promising place for alien life to have gained a foothold, Nasa scientists say. The huge body of water spread over a fifth of the planet’s surface, as great a portion as the Atlantic covers the Earth, and was a mile deep in places. In total, the ocean held 20 million cubic kilometres of water, or more than is found in the Arctic Ocean, the researchers found. 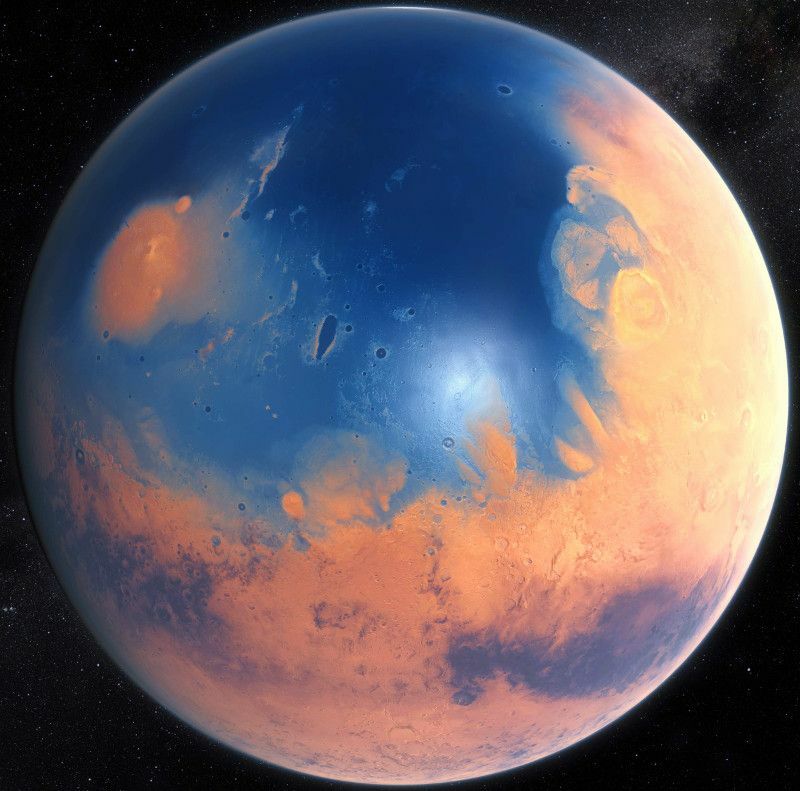 Unveiled by Nasa on Thursday, the compelling evidence for the primitive ocean adds to an emerging picture of Mars as a warm and wet world in its youth, which trickled with streams, winding river deltas, and long-standing lakes, soon after it formed 4.5bn years ago. The view of the planet’s ancient history radically re-writes what many scientists believed only a decade ago. Back then, flowing water was widely considered to have been a more erratic presence on Mars, gushing forth only rarely, and never forming long-standing seas and oceans. “A major question has been how much water did Mars actually have when it was young and how did it lose that water?” said Michael Mumma, a senior scientist at Nasa Goddard Space Flight Center in Maryland. Writing in the journal, Science, the Nasa team, and others at the European Southern Observatory (ESO) in Munich, provide an answer after studying Mars with three of the most powerful infrared telescopes in the world. The scientists used the Keck II telescope and Nasa’s Infrared Telescope Facility, both in Hawaii, and the ESO’s Very Large Telescope in Chile, to make maps of the Martian atmosphere over six years. They looked specifically at how different forms of water molecules in the Martian air varied from place to place over the changing seasons. Martian water, like that on Earth, contains standard water molecules, made from two hydrogen atoms and one oxygen atom, and another form of water made with a heavy isotope of hydrogen called deuterium. On Mars, water containing normal hydrogen is lost to space over time, but the heavier form is left behind. When normal water is lost on Mars, the concentration of deuterium in water left behind goes up. The process can be used to infer how much water there used to be on the planet. The higher the concentration of deuterium, the more water has been lost. The infrared maps show that water near the Martian ice caps is enriched with deuterium. The high concentration means that Mars must have lost a vast amount of water in the past, equivalent to more than six times that now locked up in the planet’s frozen ice caps. The scientists calculate that the amount of water was enough to create a global ocean that covered the entire surface of Mars to a depth of 137m. But Mars was probably never completely submerged. Based on the Martian terrain today, the scientists believe the water pooled into a much deeper ocean in the low-lying northern plains, creating an ocean that covered nearly a fifth of the planet’s surface. The Atlantic, by comparison, covers about 17% of Earth’s surface. “Ultimately we can conclude this idea of an ocean covering 20% of the planet which opens the idea of habitability and the evolution of life on the planet,” said Geronimo Villanueva, the first author on the study. The huge body of water lasted for millions of years. But over time, the Martian atmosphere thinned. The drop in pressure meant more ocean water wafted into space. The planet lost much of its insulation too. No longer warm enough to keep the water liquid, the ocean receded and eventually froze. Today, only 13% of the ocean remains, locked up the Martian polar caps. “We now know Mars was wet for a much longer time than we thought before,” said Mumma. Nasa’s Curiosity rover has already shown that Mars had standing water for 1.5 billion years, longer than it took for life to emerge on Earth. “Now we see that Mars must have been wet for a period even longer,” Mumma added. John Bridges, a planetary scientist at Leicester University, who works on Nasa’s Curiosity rover mission, said Mars was surely at least habitable in the distant past. “Ten years ago, the story of water on Mars was an occasional flood of rocky debris every 100m years that then switched off again. We now know it’s more continuous. There were long-standing bodies of water: lakes, deltas and perhaps even seas,” he said. “It seems to me that we have excellent evidence that Mars was once habitable, though whether it was ever inhabited is not clear. But there’s a chance. A life-bearing meteorite might have been ejected from Earth and could have landed in the water on Mars,” he added. The search for life on Mars will ramp up in 2018 when the European Space Agency sends its Exomars rover to the red planet. The rover will look for chemical signatures of life, perhaps emanating from microbes living deep beneath the Martian soil. Last year, Nasa’s Curiosity rover detected methane in the Martian atmosphere. The finding sparked intense speculation that the gas might be coming from living organisms. It might, but there is no evidence to suggest it is. Methane is regularly produced on planets through geological processes without any need for life. Charles Cockell, professor of astrobiology at Edinburgh University, said: “The longer water persists on a planetary body in one location, particularly if there is geological turnover, the more likely it is that it would provide a habitable environment for a suitable duration for life to either originate or proliferate. An ocean would meet this need.” That life was possible does not make it inevitable though. “Of course, it could have been uninhabited,” he added.